Family says former Toronto mayor Rob Ford has died at 46 after fighting cancer. 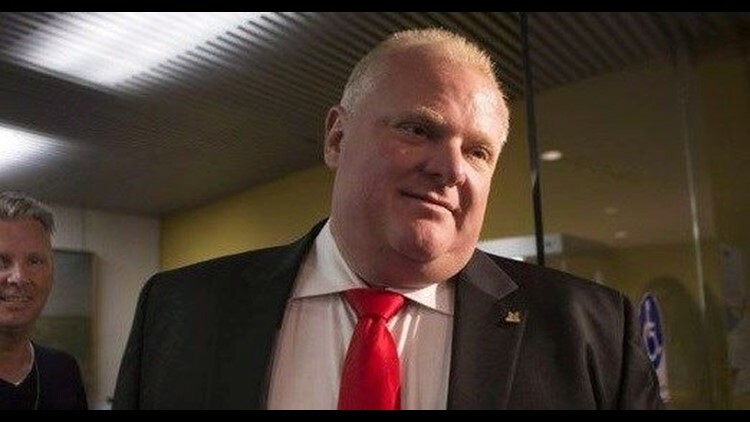 TORONTO (AP) — Rob Ford, the pugnacious, populist former mayor of Toronto whose career crashed in a drug-driven, obscenity-laced debacle, died Tuesday after fighting cancer, his family said. He was 46. Nevertheless, he was later elected by a landslide to a city council seat, a job he held until his death. But his popularity continued. Even after a scandal broke about Ford's use of crack cocaine, hundreds of people lined up for bobblehead dolls of the mayor, signed by Ford himself. Ford spent countless hours taking pictures with residents eager to be photographed with an international celebrity. Current Toronto Mayor John Tory said Ford was a "profoundly human guy" and said "the city is reeling with this news." "He was a man who spoke his mind and who ran for office because of the deeply felt convictions that he had," Tory said. "I know there are many who were affected by his gregarious nature and approach to public service." Canadian Prime Minister Justin Trudeau tweeted that Ford "fought cancer with courage and determination" and offered condolences to the Ford family. "Yes, I have smoked crack cocaine," Ford told reporters after he stepped off an elevator. "But, no, do I? Am I an addict? No. Have I tried it? Probably in one of my drunken stupors, probably approximately about a year ago."